Every once in a while a debut novel comes along that is so startling and well-written that one has to ask about its author: "Who is this guy?" Dodgers is one of these, and Bill Beverly is that guy. A Michigan-born and -raised academic (Ph.D. in American Literature, associate professor of English at Trinity College in Washington, D.C.), Beverly seems to have tossed aside his credentials to slide easily and confidently into the vernacular and circumscribed world of young black gangbangers from the streets of Los Angeles as four of them set out for Wisconsin in a nondescript blue van on a "just business" mission for the gang's top dog, Fin. 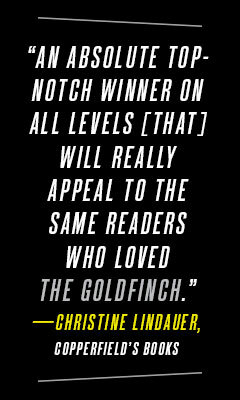 Dodgers is a road trip novel, a coming-of-age novel, a crime novel--and more. It's hard not to hear echoes of Huckleberry Finn here--or On the Road, Lord of the Flies, Clockers, The Road--but there is nothing derivative about Beverly's tale of four black kids from Compton confronting white Middle America for the first time. Dodgers is a novel as durable and expansive as the early-winter trees 15-year-old East notices along the Iowa-Wisconsin border: "Trees unlike the trees in L.A: these rooted hard, grew up tall, muscular, their bare limbs grabbing all the air in the world." In the van's middle bench rides East, Fin's loosely related nephew who has risen from drug house lookout to running a crew of younger kids because he "looked quiet and kept quiet... there wasn't much to him. But he watched and listened to people." East's "shambling and grinning" younger brother, Ty, takes the back seat, thumbing his video game with "already something chiseled in him... like the midair coil the whip made between handle and crack." At the wheel is the oldest, fast-talker Michael Wilson, who dropped out of college when he reported back to Fin "there was more weed at UCLA than you could keep track of," so it was a better source than a market. Sitting shotgun, fat Walter is Fin's fixer and problem solver--"he played around a thought, discarded it, played around another." As the crew prepares to head East with a roll of gang cash and fake IDs, Fin's second-in-command, Johnny, takes them to buy new L.A. Dodgers gear because "white people love the Dodgers." Despite their grousing about the lame van and new tees, he tells them: "you ain't gonna look like ignorant gang boys, which is what, in fact you are... in this car you look like four mama's boys going to a family reunion, which is what you want to look like." And so they set out, without cellphones or connection to their drug 'hood known as The Boxes, and make their way through the mountains and the plains. Cocky Michael Wilson gets them into their first trouble when he pulls into a Vegas casino for a taste of high-life gambling; Ty gets them out of it. East takes the wheel in Utah, even though he's never driven over 40 in the city, and soon he's cruising at 75 as the others sleep, savoring the quiet and the van: "sorry-looking, yeah, but solid. He liked being up high, liked the firm seat." In Colorado, Michael Wilson finds more trouble trying to pick up a truck-stop girl hitching down the highway. East confronts him and they fight. The volatile Ty fixes this one, too, and Michael Wilson is left behind. As they move through empty Nebraska to Iowa and finally Wisconsin, Beverly captures East's innocent wonder at the edges of Midwestern towns, the "tipped, sunken sidewalks... bacon-smelling restaurants and used-car lots laid out precisely, wheel facing wheel, headlights polished and aligned, everything eyeing everything else." At a small lake in central Wisconsin they find their target, and Ty again takes care of business, like "a monster who rises out of the sea and then submerges." But things go south. Their van gets vandalized and spray-painted with a racial slur by local kids out trashing for fun. Always on edge, brothers Ty and East get crossways over stealing a different car to get home. Walter puzzles out a way to score himself a plane ticket out of Des Moines. Alone, East makes his way farther east to a small town in Ohio, where, exhausted with running, he settles into a job at a paintball range cleaning the lockers, renting equipment, policing the grounds, enforcing the rules, and becoming the go-to guy for the terminally ill owner, Perry Slaughter. Symbolically, East finds a worn Ohio State T-shirt emblazoned CHAMPION, and so he "wadded up the last bitter Dodgers T-shirt and stuffed it into the trash. Farewell to baseball. Farewell to all that white people's love." Slaughter trusts him, and East builds a new life as a de facto black cop in a white-guy war games world--until someone from Fin's crew back home finds him. Bill Beverly grew up in Kalamazoo, Mich., and studied at Oberlin College and the University of Florida. 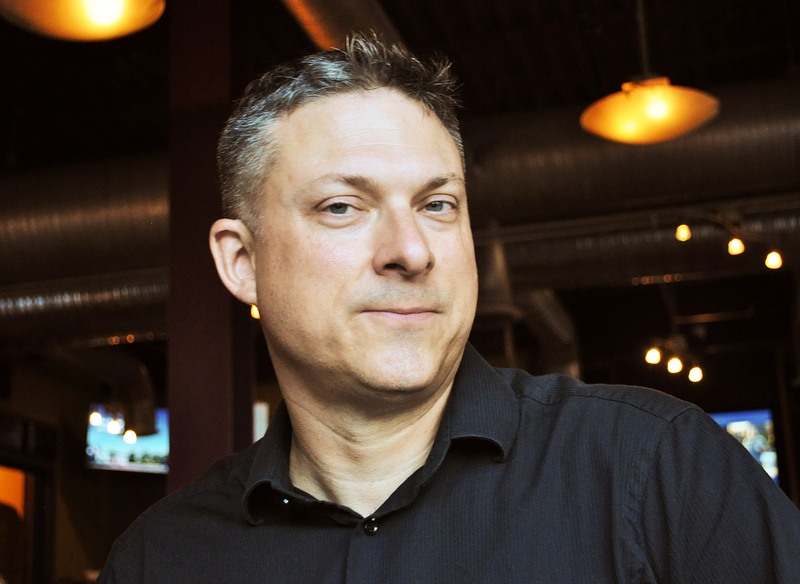 His research on criminal fugitives and the stories surrounding them became the book On the Lam: Narratives of Flight in J. Edgar Hoover's America. His debut novel, Dodgers, will be published by Crown on April 5, 2016. Beverly teaches American literature and writing at Trinity University in Washington, D.C.
You grew up in Michigan and reside in Maryland. You write about The Boxes--the projects and drug houses of Los Angeles--with the great familiarity. Have you spent much time there? What drew you to this setting and these characters when you began writing Dodgers? I never spent any time in L.A. until the last 10 years. But for me and a lot of people, L.A. is an imagined city, an imaginary city. I grew up in the 1970s; I grew up digesting LA stories--Nathanael West, Chester B. Himes, Joan Didion, James Ellroy, Steve Fisher, Chinatown, Blade Runner, The Player, Boyz n the Hood. I read The Last Days of the Late Great State of California, Curt Gentry's imaginary earthquake apocalypse, over and over again, I mean, when I was seven or eight. City of Quartz, City of Nets. I had spent a lot of time dreaming California before I ever landed there, ever got to see the light and smell the air and listen to people deciding things. You have an easy yet authentic approach to street language. How did you go about tackling the question of authentic speech and slang in dialogue? I let East's voice take its tense, bristly shape. He speaks to instruct, to steady things, to survive. Other characters complement him. "Authentic" can mean a lot of different things. I never tried to tune him to some neighborhood. Folks have said, Oh, East's from Compton: he's not. I don't know Compton. I invented The Boxes so East could sound like himself, so his voice could be tuned to his way of seeing the world. That's the only wavelength I sought to maintain. Whether in fiction or culture in general, a cast of four kids from the hood risks being written off without a closer examination, which is precisely what makes them such great characters. Describe the personalities of East, Ty, Walter and Michael Wilson, and how they differ from each other. "East looked quiet and kept quiet. He didn't look hard. He didn't look like much. He blended in, didn't talk much, was the skinniest of the bunch. There wasn't much to him. But he watched and listened to people. What he heard he remembered." He is fifteen, which is to say: a very old boy, a very young man. He is in charge, has been for some time. He's good at what he does. Yet he's blindly naïve to how small his chair is in the world, and how easily that chair might knock over. The other three rile East up. Michael Wilson is smart, proud, good-looking. He gets what he wants in the world, and he wants a lot. Walter is a computer kid. His toughness is put on. He doesn't belong here, perhaps, and he's a mess: he appalls and impresses East both. And Ty is a frightening kid--casual with a weapon, sleepy like a snake. He's East's brother, and there is no love lost. Dodgers is, in a sense, a road novel. What was it like taking characters whose identities have been so formed by their violent, impoverished environment and putting them out on the road? What opportunities did that afford you as a writer? American road stories are again and again about finding yourself, right? About seeing yourself reflected in the landscape, whether it's Easy Rider or Wild or Thelma and Louise or Invisible Man. That by riding around we'll discover ourselves, we'll heal ourselves. It's a myth, maybe a terrible one. But we're deep inside it. Richard Price's Clockers made me start imagining in this direction. At the end of Clockers, Strike hits the road. New Jersey has become dangerous for him, probably terminal. Getting out is saving his life. And the book ends there. But I always was red-hot at the end of that book, and the movie Spike Lee made. I was always burning to know what happened out there. And maybe the out there I imagined is the landscape I chose for East. 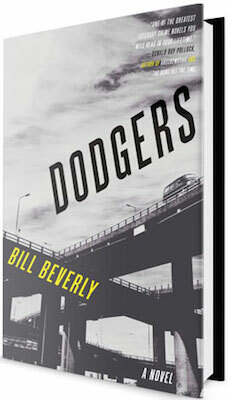 Dodgers fits in the great crevice of "literary crime/suspense." 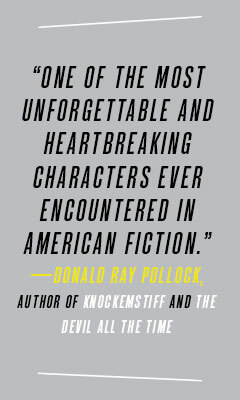 I'm reminded of Richard Price and Dennis Lehane, as well as other stylists, like Richard Lange and Tim Johnston, who provided great blurbs for the book. Yet, you are doing so much here that is wholly your own. Who are some of your heroes that shaped your writing? It is a great crevice, but less hidden than it's been. Those fellows are all real writers and I am happy that people know it. My debt to Mr. Price I've mentioned already. I studied with Padgett Powell at Florida, and so had been taught to attend to sentences. Denis Johnson is the first writer I ever read again and again, enviously, the first whose sentences hurt me. Then I started on Baldwin. I am not sure anyone touches Baldwin's sentences. There's one book I got to when I was about 10 or 11 that has stayed with me: Roald Dahl's Danny, the Champion of the World. Dahl's books for kids are great. But Danny is a fifth-grader's crime novel. I read it to my fifth-grader last year. You use a lot of distinctive devices to maintain tension and suspense in the story. There is the uneasiness that one of them might have a gun, when they are supposed to be making the trip clean. They aren't supposed to leave the van, yet they almost get arrested in Las Vegas because one of them wants "just a taste" of the casinos and big lights. After that, you don't know what's going to happen next, or if they even stand a chance making it to their destination so far from home. Tell us about the different sources you drew from to create suspense throughout the novel. Oh, it's the characters. These four were going to find trouble. A good hand to play. I just bet the talent. What do you think your novel reveals about the widespread experience of drugs, crime, violence and poverty in America, a topic that often goes unexplored in fiction? That is a good prompt, and I thank you. It's tempting to try to take that extra base, especially when my day job is in the what-does-this-reveal industry. Meeting any person shines some light behind them, on the places or people or experiences they come from. But I'm gonna stop here, on first. I hope that Dodgers can keep people turning the pages. That's the main thing. Dodgers is a refreshing read. I only hope this is a trend we see more of in American fiction in 2016, because it is desperately needed. Thank you! More reading, more refreshment. I couldn't agree more. Thank you!